Thank you so much for my beautiful bouquet it was absolutely stunning and so personal for me. Absolutely beautiful flowers amazing customer service lovely lady. Received my flowers they are absolutely beautiful! I’m so pleased with them u r one talented lady!!!!!!! Wow! What can I say! Anna has given me the most amazing bridal bouquet that I could have ever asked for! The service I received was fantastic! She always kept me up to date with the progress and answered all of my questions. I can’t thank her enough, I’m very much looking forward to using it next month! Received my flowers this morning, and I have to say they are amazing! The pictures Anna sent did not do them justice, they are just beautiful. Nothing was too much trouble! Gorgeous flowers and fantastic communication!! Thank you Anna. Highly recommend!! They actually look even nicer than the picture. Delighted with my purchase and service. Anna, Thank you so much for my flowers I love them. Anna did an amazing job on my silk floral arrangements. They were true to the pictures and I was very impressed with the fine detailing on each bouquet. Everything arrived safely and on-time. I would definitely recommend Bridal By Anna to anyone looking for silk floral arrangements for their wedding party! 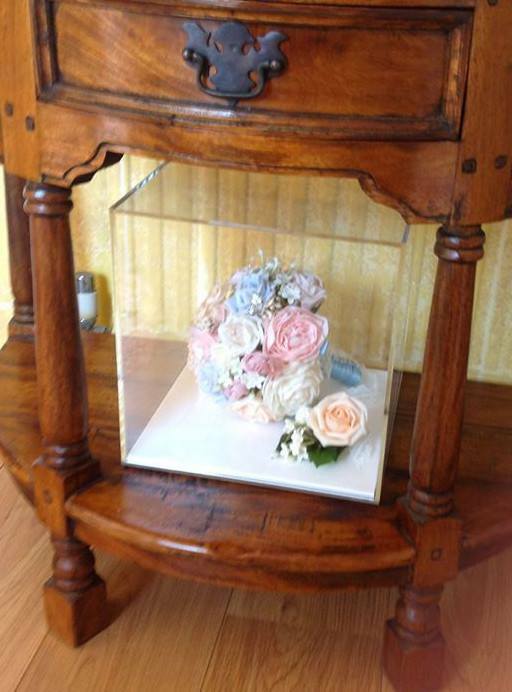 Thanks so much for your fab work, absolutely love the bouquets, the button holes and corsage. They are beautiful, looked great with the theme of my wedding and dresses and received so many lovely comments throughout the day. Would definitely recommend you! Received our flowers today and they are beautiful! Exactly how i wanted them and very pretty! Can’t wait to get married now, thanks Anna!! Beautiful flowers! Excellent communication and quick response! Anna did an amazing job of making my flowers personal to me, they were exactly what I wanted! Fantastic communication throughout and seeing pictures along the process make it more special. Would very highly recommend to anyone wanting the perfect bouquet on their special day! Absolutely gorgeous flowers, such an amazing alternative to real flowers on your wedding day. No last minute stress, no petals falling off and a keepsake of your special day! P-E-R-F-E-C-T … you’re a star, an absolute star!!! Thank you so very, very much Anna .. it’s been an absolute pleasure .. thanks for everything!! Thank you so much for my beautiful bouquets they have really added to some incredible photos! Absolutely gorgeous flowers and amazing communication! Been looking for ages to find someone who can make my dream wedding flowers at a reasonable price! Anna has totally outdone herself!! Very highly recommended! Love love love my flowers!! My daughter was thrilled with her corsage. It was absolutely beautiful and Anna even managed to source a pretty little bracelet to fit my daughter’s tiny wrist! Both the service and communication were excellent and I would happily recommend to anyone. I am extremely over the moon with my two bouquets they are stunning, fantastic communication looking forward to the big day now so I can show them off! Just received my gorgeous bouquets from the Lovely Anna. Exactly what i was looking for, i am so pleased with them. Anna was so helpful and communicated with me regularly to make sure i was happy with what she had put together. She was really great,especially having to deal with my many emails and pictures that i sent to show her what i was looking for. I would definitely recommend Anna. Thank you so much, you’re a star! !